As part of Waitrose’s ongoing commitment to grass roots cricket, England’s star one day batsmen Eoin Morgan paid a visit to Maidenhead & Bray CC on Sunday August 17th. The Middlesex star took time out from a busy summer of international cricket as part of an ECB initiative to boost participation at recreational cricket clubs through the hosting of a Club Open Day, in partnership with Waitrose. Whilst at the club, Morgan oversaw junior coaching sessions and provided a batting masterclass to members of the Berkshire club, where Sir Michael Parkinson holds the President position. The England one day specialist also passed on his comments and thoughts ahead of the Royal London One day international series with India in a specially hosted Q&A session, before finishing the day by signing autiographs for the lucky juniors who had turned up. The event was a great success and continued a busy summer of activity for Waitrose. 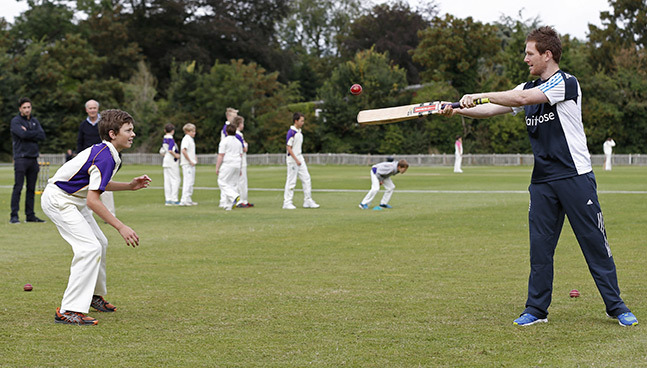 During the 2014 season, almost 1,000 clubs held similar Club Open Day on England’s international cricket weekends. Each event is supported by Waitrose who are donating £100 worth of food and drink to clubs, with the aim of attracting more players and volunteers through the doors of clubs.